You might be familiar with this situation: You have 2 PC's and just want to quickly copy one file from PC1 to PC2. Unfortunately, you do not have access to a network, or a UTP crossed cable, or the network you have is simply too slow. As of Windows ME, Windows supports FireWire (more or less), also known as IEEE 1394 or iLink (Sony). FireWire is a pretty fast connection and can be used for this purpose. Note: Such a connection between two Windows XP PC's is really FAST! Tip: Once you're done using the sharing, it's a good idea to disable the sharing of the folders. We're about to connect two PC's, for transferring files from one PC to another, using a high speed connection. We will use FireWire/IEE1394 for this. First requirement: Both PC's do need to have a FireWire connection. This very small connector is commonly found on laptops, portable devices and DV camcorders. This somewhat larger (and easier to use) connector can be found on desktop PC's and less portable devices like scanners etc. Having some fancy connectors won't do the job ... we do need to connect them somehow. Second requirement: a FireWire/IEE1394/iLink cable. An advantage of FireWire is that we do need any special cables. A normal straight FireWire cable will do the trick. The connectors at the ends of the cable needs to be either of the type A and/or C (as shown in picture above). 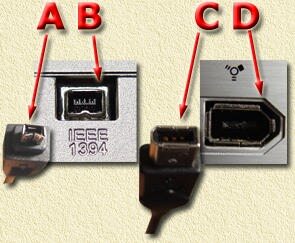 Which connectors you need, depends on the connectors of each of the PC's (see B and D). Third requirement: an operating system that supports this feature. Or in other words: a Windows version that supports networking over a FireWire connection. As far a I know, only Windows ME, Windows 2000 and Windows XP do support this. The Macintosh might support this as well, but, well,... I haven't seen any Mac donation lately so I don't have a Mac to test this. Best results are achieved using Windows XP. Tip: For operating systems that do not support this, visit UniBrain, they have specific software (FireNet) for this purpose. Tip: Windows ME is known to be a bit flaky with FireWire, usually connection tend to be extremely slow. Windows 2000 does a better job but seems to have issues too. Connecting is easy: Just plug in the Firewire cable into both PC's. This is best done when the PC is already running. Sharing files can be a bit more complicated for those of you who never worked with Windows networking before. At least one folder has to be shares - meaning that the folder is accessible from another computer. Click a folder with the right mouse button and choose "Properties" from the menu. A window appears with some tabs. Click "Sharing". Click the blue text that says "If you understand the security risks but want to share files without running the wizard, click here.". A new window will appear. Choose the second option "Just enable file sharing" and click the "OK" button. This window below will appear. Check the option "Share this folder on the network". If you want to be able to write to this folder from another PC, then check "Allow network users to change my files" as well. Now click the "OK" button . Repeat this (if needed) for other folders or drives as well. Optionally you might want to share some folders on the second PC as well. First we do need to know the names of the individual PC's . The command will reply with some data, including the name of the PC (indicated in yellow here). Remember this name and repeat the same thing for the second computer. Now go to "My Network Places" and double click "Entire Network". There double click "Microsoft Windows Network" and finally double click "Workgroup". If all works well, any available PC will now appear. However, for a PC to appear it will need to have at least one shared folder. Double click the PC-name and you'll notice the shared folder(s) which you can now use for copying. 1) Check the cable - a bad connection might be the cause of your problems. 2) "1394 Connection" has not been activated. Go to "Start" - "Control Panel" - "Network Connections". At "LAN or Highspeed Internet" you'll see and icon called "1394 connection". Click it once with the left mouse button. The disabled network connection will now be enabled (Showing a "Enabling" window). 3) Windows hasn't completed it's configuration. - In the Systray (Where you'll find the Windows clock) there should be an icon indicating that the network is up and running. Note: Sometimes there is no such icon. Go to "Start" - "Control Panel" - "Network Connections". In the "LAN or Highspeed Internet" area you'll see an icon called "1394 connection". Click it with the right mouse button and choose "Properties". In the upcoming Window, check "Show icon in notification area when connected". - Second step to take: check if Windows did configure the network settings. You see a list of network settings for all available network cards (that have been enabled). We indicated the FireWire past in red. If this info does NOT appear, then try this: unplug the FireWire connector. Wait a few seconds and plug it in again. Again wait a few seconds and try the IPCONFIG command again. 4) I can't see the other computer. - You haven't shared a folder on the second computer. Solution: share a folder on that computer. - Windows isn't really awake yet. Windows hasn't really opened it's eyes to look for other computers. We can speed this a bit up by using the PING command . Go to the second PC and do the IPCONFIG trick. Write down the value at the field called "Autoconfiguration IP Address" (in the example this is "169.254.110.168"). Write it down and go back to PC number one. Open a DOS window and type "PING 169.254.110.168" - be sure to replace "169.254.119.168" by the info you got from the other PC. The result might look as shown above. In this example it all works fine. For some reason the PING awakens the PC and guess what ... you most likely see the missing PC in "My Network Places". Note: A "Request Time out" indicates that the other PC cannot be reached ... check the cables! Sometimes Windows can be a pain concerning the rights of users. Make sure the users of PC1 are know on PC2. At least for the username's you're using for copying files! This means that on both PC's the user "John Doe" needs to exist with password "Something" (just an example).